Elise is 21 months old now and is a little bit obsessed with her potty. She isn't quite ready for toilet training yet, as she brings over the potty after she has been to the toilet, but as she is showing interest we have been trying to encourage her. 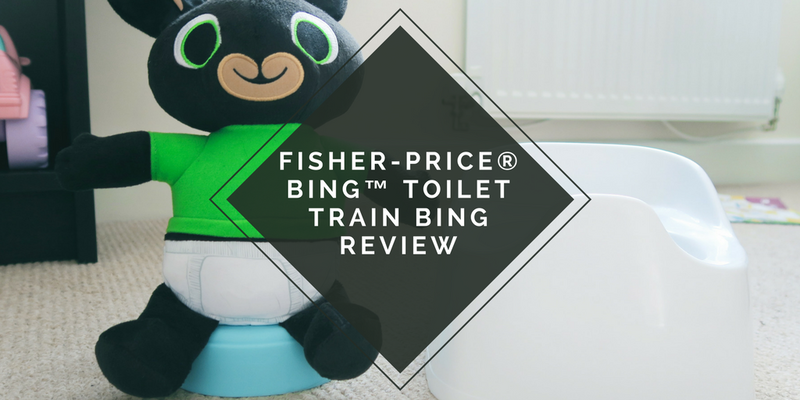 When we were asked if we would like to review the Toilet Train Bing toy from Fisher-Price, it couldn't have come at a better time. 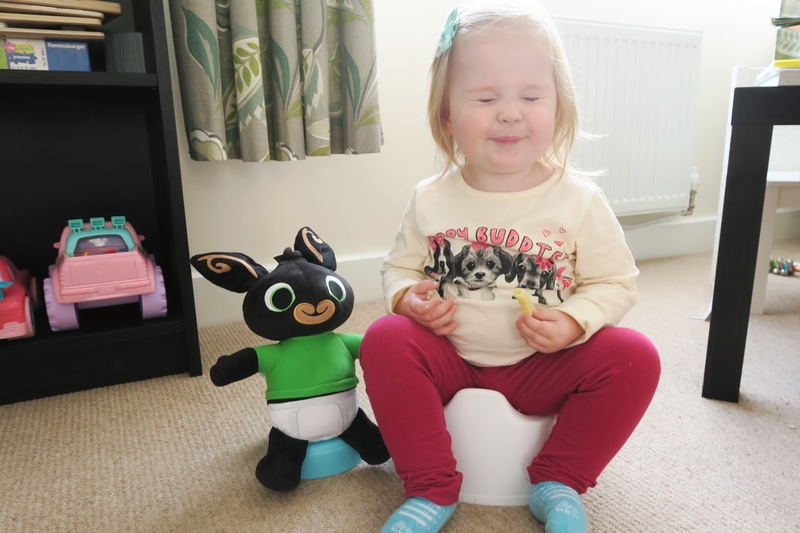 Elise loves watching Bing, and seeing what adventures he gets up to, and having Bing matched with his very own toilet has been a great way to introduce the idea of using a potty to her. If you have been following us for a while, you will know that Elise has been a bum shuffling fan, and until recently she hasn't been walking. For the last month, she has been playing with Bing and putting him on his toilet, but as she hasn't walked, she hasn't been able to walk around with him and sit on her own potty. She's only been confidently walking for a few weeks, and since then the Toilet Train Bing toy has really started to become one of her go to toys to play with. The Toilet Train Bing has over 50 phrases, and with a simple press of his tummy the fun begins. Bing wants to play hide and seek with you, and this is one of Elise's favourite games to play at the moment. She loves to hide him, or rather run and hide from him! Whilst playing, Bing will suddenly need to go to the toilet, which means that Elise has to rush him over to the potty. She has really grasped the concept of when he is asking to go, and runs him over to the potty, and then sits down on her own potty whilst he goes. Another aspect of the Toilet Train Bing that we love is that when he doesn't make it to the toilet, a little patch of wee shows up in his underwear. He lets you know that he hasn't made it, and you can then explain to your little one that this is okay, and next time you just have to be quicker to get to the potty. When he does make it, you can hear him having a wee, and then when you remove him the toilet flushes, just like the real thing. Something that has happened since Elise started to play with the Toilet Train Bing is that when myself, or her dad use the toilet she says "Wee, Wee" and understands what we are doing. She has also started to say "Elise wee" and wants to sit on her own potty to try and do a wee. With some toys that have the branding of popular shows, you find that the voice doesn't sound exactly like the character. This is not true for the Toilet Train Bing toy. It sounds exactly like the cute bunny you see on your television screens, which means that your child may already feel like they are a familiar friend. You can also find an episode all about the toilet train, so we watched this with Elise before we played with the toy for the first time. She then wanted to act out what she had seen, and we added in a whole play element when we showed her what Bing was doing. She now goes "Choo Choo" whilst walking over to sit on her potty. I think this is going to be a great tool to use when we are out and about having fun, and when she doesn't want to stop playing even though she has to go to the toilet. Overall we think the the Fisher-Price Toilet Train Bing toy is a great way to introduce your child to the idea of a potty. 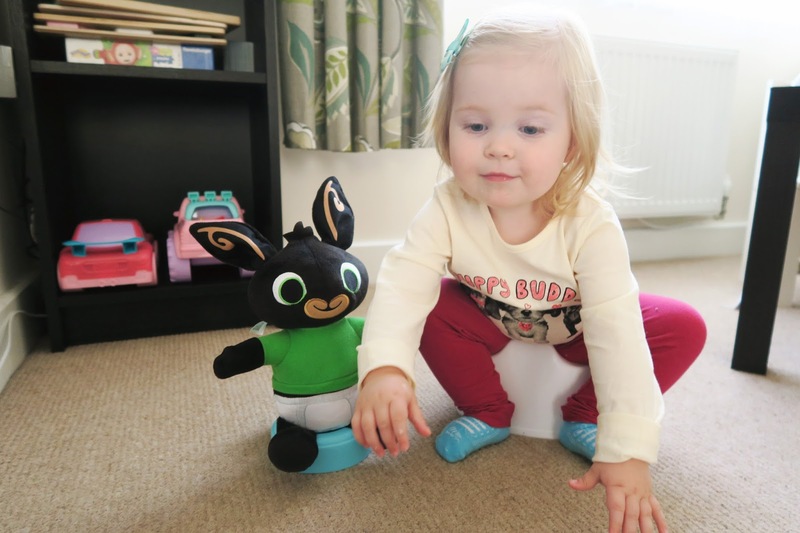 They have a little companion to join them with their toilet training journey, and to discover new games with. It helps to not only help your child learn about this important part of growing up, but it also encourages them to use their imagination in the games that Bing wants to play. The fact that Bing also has accidents lets your child know that even their favourite bunny friend sometimes doesn't make it to the toilet and that is okay. She does find it a bit difficult to take off his underwear at the moment, as his tail gets in the way a bit, but this is something that she will be able to do in the future. We also found that sometimes it seemed as though he wet himself a bit quickly, so she didn't have time to get to the toilet, especially when playing hide and seek. Although I guess this mimics real life as you may not be close to the toilet. The Fisher-Price Toilet Train Bing toy retails for £31.99 and is suitable for children aged 2+, although I found it great for Elise who is not quite 2 yet.